Armstrong Street, the street running north to south in the middle of downtown Bixby, was named to honor Frank Armstrong. Although it is not documented in this article, it is reasonable to believe the street was named honoring Gen. Frank Crawford Armstrong and not his father, Maj. Frank Wells Armstrong. 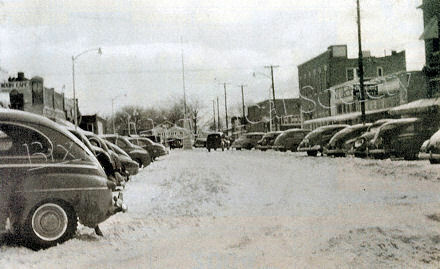 In the photo >> Looking south on Armstrong Street in downtown Bixby during the late 1940s. The Bixby Cafe sign and Citizen Security Bank clock stand out on the left. Bixby Memorial Flagpole stands tall in the middle of the intersection of Armstrong & Dawes. At the far south end of Armstrong is Moore’s Feed Store. General Frank Crawford Armstrong served as chairman of the Dawes Commission and Commissioner of Indian Affairs in Indian Territory. His father, Major Frank Wells Armstrong, also, served as Commissioner of Indian Affairs in Indian Territory, as did his uncle, William Armstrong. Both father and son are documented as Francis Armstrong, as well. Frank Crawford Armstrong was born November 22, 1835, at the Choctaw Agency, Skullyville, Indian Territory. He was the only native born citizen to serve on the Dawes Commission. He was the son of Maj. Frank Wells Armstrong of Tennessee and Anne M. (Willard) Armstrong of Maryland who married September 11, 1833. According to Carolyn Thomas Foreman, Chronicles of Oklahoma, Frank Wells Armstrong was in Indian Territory by 1831. Perhaps as early as 1830. He was the first Choctaw agent in the West. He died there in 1839 and was succeeded by a brother, William Armstrong. Young Frank C. Armstrong was educated at Holy Cross College in Worchester, Massachusetts. He is shown in the school registry as both Frank C. and Francis Gough Armstrong. The name of the mother, date and place of birth are the same for both names. It is believed the given name, Frank Crawford, was his confirmation name. In 1854, at the age of 19 years, Armstrong joined his stepfather, Gen. Persifor Frazer Smith, former Mexican-American War general, in Texas for a trip across the state from Corpus Christi to El Paso. He was given an appointment as lieutenant in the Second Dragoons on June 7 1855 because of his bravery during that trip. He served in Texas, Kansas and Nebraska until 1857 when he accompanied General Albert Sidney Johnston to Utah. 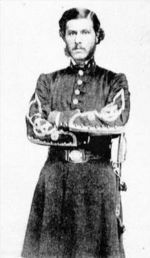 Armstrong became a first lieutenant on March 9, 1859 He was advanced to captain on June 6, 1861 and transferred to the Second Cavalry at Fort Leavenworth on August 3, 1861. He was the youngest captain in the U.S. Army at the outbreak of the Civil War. Ten days later, he went with his troops to Washington D.C. where he resigned. He, then, joined the Confederate States Army. His first assignment was as adjutant general under Gen. Benjamin McCulloch in Arkansas. Shortly before his death, Gen. McCulloch appointed him major. In no time at all he was elected colonel of the Third Louisiana Infantry. Armstrong organized a cavalry command that carried the war into Mississippi and Alabama. He advanced through the ranks quickly because of his training in the U.S. Army. He was appointed brigadier general and served under the command Gen. Earl Van Dorn, Gen. Nathan Bedford Forrest & Maj. Gen. Joseph Wheeler. The last battle in which he participated was at Selma, Alabama, under the command of Gen. Forrest in April 1865. Frank C. Armstrong married Maria Polk Walker of Columbia, Tennessee, probably on April 27, 1863. She was the daughter of Gen. Knox Walker and great niece of President J. K. Polk. A daughter, Isabel Armstrong, was born February 29, 1864. A son, Knox Walker Armstrong, was born in 1865 and died in Tennessee in 1867. Rev. Thomas B. Ruble reported to the Fort Smith Herald on June 6, 1867 that Armstrong and his family were living in Indian Territory near Honey Springs battleground. Maria Armstrong preceded her husband in death. Armstrong’s second wife was Charlotte Combs of St. Mary’s Co. Maryland. She was the widow of Kilty MacSherry, Lieutenant in the U.S. Navy. They married 1875, in Washington, D.C. and had no children. After the Civil War Armstrong was engaged in the Overland Mail service in Texas. He was U.S. Indian Inspector from 1885-89. While Inspector he helped settle the Cherokee Bushyhead-Mayes election controversy in Tahlequah, Cherokee Nation, December1887. He became Assistant Commissioner of Indian Affairs in 1893 and held the position until about 1895. He replaced Meredith H. Kidd on the commission to, “treat with the Five Civilized Tribes in order to induce homesteading,” in 1895, This commission is commonly known as the Dawes Commission. Also, appointed at that time were two additional members of the commission, Thomas B. Cabaniss and Alexander B. Montgomery. In 1897, Armstrong was acting chairman of the Dawes Commission in place of Henry L. Dawes who was in failing health, according to the Atoka Agreement of that year. He remained acting chairman until he resigned the commission in 1898. His vacancy on the Commission was never filled. During the latter years of his life, Gen. Frank Crawford Armstrong lived in Washington, D.C. According to his biographical sketch, he was interested in mining and other operations in Mexico before his death. He died at Bar Harbor, Maine on September 8, 1909 at the age of 75 years. He was survived by a daughter, Isabel Barklie of New York & Pennsylvania, and his wife, Charlotte Armstrong. He is buried at Rock Creek Cemetery, Washington, D.C. His tombstone reads: “Frank C. Armstrong, Brig. General C.S.A, 1835 – 1909”. Also buried adjacent to his grave are Charlotte Combs Armstrong, his second wife, who died June 19, 1910 and Isabel Armstrong Barklie, his daughter, and her husband Archibald Barklie.